Strategic technology support for forward-thinking leaders of higher education. In this era of unprecedented change and increased reliance on technology, are your institution’s technical resources pushing you ahead or holding you back? Get the most out of their IT and staff investments and budget. Stay one step ahead of the rapidly-evolving needs of students, staff and stakeholders. Deliver complex IT projects on time and on budget. Provide clear, campus-wide visibility and accountability. Achieve strategic goals and capitalize on new opportunities. Ensure their campus is “future ready,” no matter what the future holds. 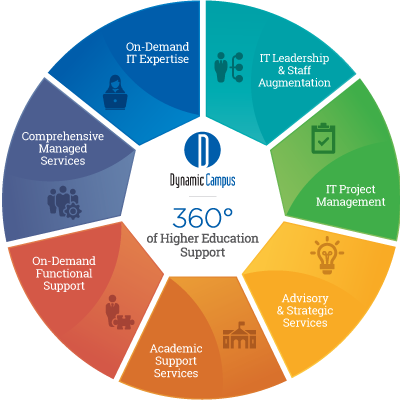 Colleges and universities that partner with Dynamic Campus get immediate access to a deep bench of experienced IT professionals and leaders ready to tackle the toughest technology challenges and give students, faculty and staff the capabilities they need to succeed. We call this comprehensive, holistic methodology 360° of Higher Education Support™. "By partnering with Dynamic Campus, we can address IT challenges in a strategic, clarified and intensified fashion. Today, the university hums under the hood." If you’re ready for a high-performance campus that can turn strategy into reality and achieve your institutional goals, contact Dynamic Campus below or call us at 888-805-3022 to get started.